Hi…..I have a C-Scope K5000 which is belt or hand held, it is very new and I have only used it a few times, would you consider a part exchange???? Hi Owen, which detector are you looking to part exchange it against? If you would like to discuss please give us a call on 01959 571255. Hi I have a Garrett ace 250 deluxe sports pack brand new and another Garrett ace sports pack used twice and I am looking to exchange for a Garrett AT Pro.The sports packs consist of 6.5×9 inch pro performance search coils/Garrett headphones/Treasure field guides/Ace Enviromental cover-up and garrett all purpose backpacks would you consider for exchange. We don’t stock Garrett detectors unfortunately so we’re unable to carry out this exchange. If you’d consider another detector that we do stock, please give us a call on 01959 571 255 to discuss. 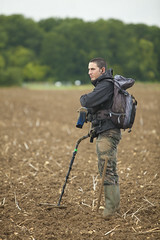 Hi would do an exchange for a Minelab x-terra 505 metal detector, Richard. Could you give us a call on 01959 571255 to discuss? Would you mind giving us a call on 01959 571255 to discuss this further? Can you give us a call to discuss this further please? You can reach us 01959 571255.